The $195.5 billion budget that senators will vote on Wednesday includes $1.4 billion extra for education and pay raises for most state employees. A House committee is expected to vote Thursday on its version of the budget. The full Texas Senate plans to vote Wednesday on a $195.5 billion budget. A day later, the House Appropriations Committee is likely to vote on its own vision of how the state should spend its money over the next two years. Then the real negotiations begin, as members from both chambers will start working to hash out the differences. “The vote that really counts is when you get the conference committee report because that's when you know everything is settled,” said state Sen. Royce West, D-Dallas. “This is just the first step in a long process." Technically, a conference committee on the budget — in which House and Senate negotiators formally meet to resolve their differences — won’t be called until the full House approves its own budget proposal, but the differences between the two chambers will become clearer Thursday once the House Appropriations acts and the complete House budget is released. State Rep. Jim Pitts, R-Waxahachie, the chamber’s chief budget writer, is expected to bring a budget to the House floor in early April. Both chambers released draft budgets in January of about $187 billion. After seven weeks of hearings, the Senate Finance Committee unanimously approved a budget last week that added nearly $9 billion in funding spread across dozens of state agencies and institutions. That includes an across-the-board 3 percent pay raise for state employees and a 10 percent pay increase for certain members of law enforcement. Under the Senate budget plan, public education would get an additional $1.4 billion, about $4 billion short of the $5.4 billion in cuts to schools that lawmakers approved in 2011. Budget writers in the House are proposing $1.5 billion more for schools. Democrats have made restoring the entirety of the cuts a priority. Senate Finance Committee Chairman Tommy Williams, R-The Woodlands, said last week that school funding is complicated by an ongoing school finance lawsuit that is widely expected to spark a special session in 2014. While the fight over public education funding is drawing most of the budget attention, the 865-page Senate budget reflects hundreds of smaller decisions by the Finance Committee that would affect Texans if they make it into the final budget. $49.4 million for the Texas Commission on Environmental Quality's Texas Emissions Reduction Program, which subsidizes companies and individuals to replace or upgrade old, dirty vehicles with less-polluting models. $41.7 million for the Commission on State Emergency Communications to upgrade its outdated 911 system and keep open all six of its poison control centers. Agency officials have warned they will have to close two of the centers without the extra funding. $4.4 million for the Railroad Commission of Texas to increase its work related to pipeline safety. $1.9 million for the Board of Dental Examiners to hire 15 more workers focused on licensing and enforcement. 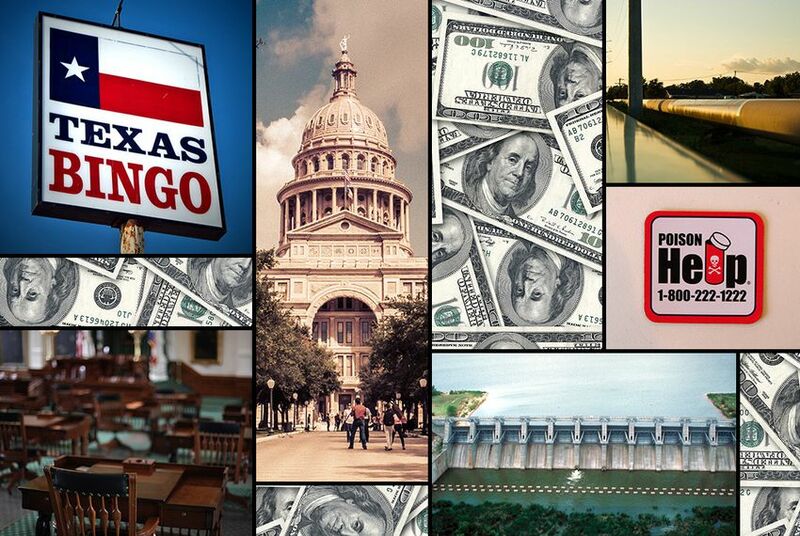 The Senate budget also gives the Texas Lottery Commission $1.3 million to hire more auditors for its bingo compliance division, which regulates bingo halls. Commission Controller Kathy Pyka said the money would reverse cuts to the division that were made last session that have made enforcing the state’s bingo regulations a challenge. “We’re trying to get back to the baseline staffing that’s required to perform those baseline functions,” Pyka said.